Tampa, Fl. August 9, 2018- A team of Florida Aquarium scientists and divers just returned after spending 15 days in the Florida Keys for a coral spawn. The team collected 150,000 coral gametes (coral eggs and sperm) during the coral spawn that only happens once a year after a full moon. The team fertilized the eggs and then released thousands back into the wild. The remaining fertilized eggs, or embryos, are being distributed to The Florida Aquarium Center for Conservation, Georgia Aquarium, Mote Marine Laboratory and Aquarium, and Nova Southeastern University to continue research and to grow the coral for a future release. This comes at a critical time since Florida is in the middle of the largest coral disease outbreak ever recorded, which is rapidly killing 20 different species of coral in the Florida Keys. The staghorn coral species, the primary species that was collected during the coral spawn, is not at immediate threat from the disease. However, it is listed as threatened under the Endangered Species Act. Scientists are trying to figure out what's causing the outbreak and how to stop it. The outbreak makes the work on reproducing corals even more important because it’s necessary to raise their offspring. O’Neil believes practicing the techniques could restock Florida's damaged reefs with the corals raised in the laboratory at The Florida Aquarium’s Center for Conservation in Apollo Beach. The lab already houses corals collected from last year’s spawn that will be celebrating their one year birthday and will be released back into the ocean later this year. The gametes were collected from the Coral Restoration Foundation Coral Nursery, with the work conducted by permit from the Florida Keys National Marine Sanctuary. The team worked with several partners including the Keys Marine Laboratory, Coral Restoration Foundation, Nova Southeastern University, University of Florida, South-East Zoo Alliance for Reproduction and Conservation (SEZARC), Mote Marine Laboratory and Aquarium, Sea World, Georgia Aquarium, and Horniman Museum and Gardens. “I think it’s a really good example of the strengths in partnerships that The Florida Aquarium has formed to help save coral reefs,” said O’Neil. Corals are not plants, they're actually animals. Called “the rainforests of the sea,” coral reefs only take up about 2% of the ocean floor, but host about 25% of all ocean species. Coral reefs grow very slowly, at an average rate of just two centimeters per year. Each individual coral is known as a polyp. The annual synchronized spawning of corals is a spectacular event. This mass reproduction only happens once a year. It involves colonies and species of coral polyps simultaneously releasing tiny egg and sperm bundles into the water. (Washington, D.C., March 22, 2018) The $1.3 trillion spending agreement reached by Congress this week contains good news for birds and bird conservation. Legislators increased funding for State of the Birds activities to $3 million, giving a boost to the conservation of endangered forest birds in Hawaii, including the creation of safe nesting areas. Congress also indicated that funding levels for work to support migratory bird conservation will remain at or be set above 2017 levels. Other positive steps for birds include preservation of conservation programs supported by the Farm Bill, America’s largest single source of conservation on private lands; full funding for the Cooperative Endangered Species Conservation Fund; and $425 million for the Land and Water Conservation Fund. Greater Sage-Grouse will continue to receive $60 million in conservation funding. However, the species is still exempted from listing under the Endangered Species Act in the new budget agreement — at a time when this iconic species is at greater risk than ever. Forest habitat conservation will see some positive gains under the spending bill. It includes a “fire funding fix” for the U.S. Forest Service, which will prevent over-budget fire-suppression efforts from being funded at the expense of other agencies’ conservation projects. It also includes an extension of the Secure Rural Schools program that supports sustainable forest management in Northern Spotted Owl habitat, as well as rural development and restoration. However, the bill also features provisions weakening the protection of endangered species in federal forests by allowing development projects to proceed without review by the U.S. Fish and Wildlife Service. (Washington, D.C., Dec. 1, 2017) Conserving Greater Sage-Grouse requires more habitat protection, not less. That’s the message conservation groups are delivering to the administration as it considers potentially devastating revisions to the landmark 2015 Greater Sage-Grouse conservation planning initiative. The revisions, if enacted, would come at too high a cost to the sage-grouse and the remaining sagebrush habitat on public lands, sending the future of both the bird and its iconic landscape back into uncertainty. Instead of changing direction, the federal government should live up to promises it made in 2015 to ensure sage-grouse protection — promises that formed the basis for not listing the sage-grouse under the Endangered Species Act. The coalition of conservation groups, which includes those most focused on sage-grouse protection over the past decade, are gravely concerned about the recommendation made in the Interior Department’s Sage-Grouse Report to roll back those vital protections and eliminate Sagebrush Focal Areas. The Greater Sage-Grouse has become a wildly popular and iconic symbol of the American West and its wide-open sagebrush basins. Year after year, sage-grouse gather in the spring at small arenas in the sagebrush called leks to dance, display, and mate. Their mating dance is one of the great natural spectacles of the West. The groups are urging Secretary of the Interior Ryan Zinke to adopt the scientific recommendations of the Bureau of Land Management’s own science team on sage-grouse. Those recommendations include refraining from fluid-mineral leasing in priority habitats, buffering leks by four miles to prevent any impacts from known disturbances, ensuring that all grazing allotments are meeting science-based standards for sagebrush habitat integrity, ceasing vegetation treatments that degrade sagebrush habitat, preserving winter habitats, limiting disturbances to one per section and 3 percent of each square mile of priority habitat, and withdrawing sagebrush habitats from mining. The agencies’ analysis should preserve priority habitats through a network of areas of critical environmental concern and zoological areas managed to protect sage-grouse, according to the groups. Instead of balancing development with conservation, the administration has adopted a policy of “energy dominance,” prioritizing fossil fuel development over other uses on western public lands. The Cornell Lab of Ornithology is a membership institution dedicated to interpreting and conserving the earth’s biological diversity through research, education, and citizen science focused on birds. Western Watersheds Project works to protect and restore western watersheds and wildlife through education, public policy initiatives, and legal advocacy. WWP works to influence and improve public lands management throughout the West with a primary focus on the negative impacts of livestock grazing on 250 million acres of western public lands. WildEarth Guardians is a nonprofit environmental advocacy organization dedicated to protecting the wildlife, wild places, wild rivers, and health of the American West. Guardians has worked for years and continues to work to protect the Greater Sage-Grouse and the Sagebrush Sea so that future generations might continue to enjoy this spectacular species. WASHINGTON (April 19, 2017) — In response to recent scientific consensus on giraffes’ vulnerability to extinction, five wildlife protection groups today petitioned the U.S. Fish and Wildlife Service to protect Earth’s tallest land animal under the U.S. Endangered Species Act. The legal petition, filed by the Center for Biological Diversity, Humane Society International, The Humane Society of the United States, International Fund for Animal Welfare and Natural Resources Defense Council, seeks “endangered” status for the species. Facing mounting threats from habitat loss, being hunted for their meat, and the international trade in bone carvings and trophies, Africa’s giraffe population has plunged almost 40 percent in the past 30 years and now stands at just over 97,000 individuals. New research recently prompted the International Union for the Conservation of Nature (IUCN) to elevate the threat level of giraffes from ““least concern” to “vulnerable” on the “IUCN Red List of Threatened Species”. Yet giraffes have no protection under U.S. law. Species designated as “endangered” under the U.S. Endangered Species Act receive strict protections, including a ban on most imports and sales. The United States plays a major role in the giraffe trade, importing more than 21,400 bone carving, 3,000 skin pieces and 3,700 hunting trophies over the past decade. Limiting U.S. import and trade will give giraffes important protections. Known for their six-foot-long necks, distinctive patterning and long eyelashes, giraffes have long captured the human imagination. New research recently revealed that giraffes live in complex societies, much like elephants, and have unique physiological traits, like the highest blood pressure of any land mammal. The IUCN currently recognizes one species of giraffes and nine subspecies: West African, Kordofan, Nubian, reticulated, Masai, Thornicroft’s, Rothchild’s, Angolan and South African. Today’s petition seeks an endangered listing for the whole species. The U.S. Fish and Wildlife Service has 90 days to review and respond to the petition and determine whether a listing may be warranted. Humane Society International and its partner organizations together constitute one of the world’s largest animal protection organizations. For more than 20 25 years, HSI has been working for the protection of all animals through the use of science, advocacy, education and hands on programs. Celebrating animals and confronting cruelty worldwide – on the Web at hsi.org. The Humane Society of the United States is the most effective animal protection organization, as rated by our peers. For more than 60 years, we have celebrated the protection of all animals and confronted all forms of cruelty. We and our affiliates are the nation’s largest provider of hands-on services for animals, caring for more than 150,000 animals each year, and we prevent cruelty to millions more through our advocacy campaigns. Read more about our more than 60 years of transformational change for animals and people. HumaneSociety.org. Founded in 1969, IFAW rescues and protects animals around the world. With projects in more than 40 countries, IFAW rescues individual animals, works to prevent cruelty to animals, and advocates for the protection of wildlife and habitats. For more information, visit www.ifaw.org. Follow us on Facebook/IFAW and Twitter @action4ifaw. The Natural Resources Defense Council (NRDC) is an international nonprofit environmental organization with more than 2 million members and online activists. Since 1970, our lawyers, scientists, and other environmental specialists have worked to protect the world's natural resources, public health, and the environment. NRDC has offices in New York City, Washington, D.C., Los Angeles, San Francisco, Chicago, Bozeman, MT, and Beijing. Visit us atwww.nrdc.org and follow us on Twitter @NRDC. Morro Bay, CA, March 28, 2017 - There's an abundance of pure unadulterated cuteness going on from the recent increase in California Sea Otter families living in Morro Bay. Mommas and babies are everywhere eating and grooming each other as if no one is watching. But we are and we can't look away - they are so dang cute! Now is the perfect time to catch a glimpse of these sea creatures in their natural habitat since Morro Bay harbor is experiencing the highest count to date of these adorable critters. A survey taken last May of the Morro Bay harbor documented 36 adult sea otters and nine pups, a significantly higher number than the typical five or fewer otters frequenting the harbor in the early 2000s. 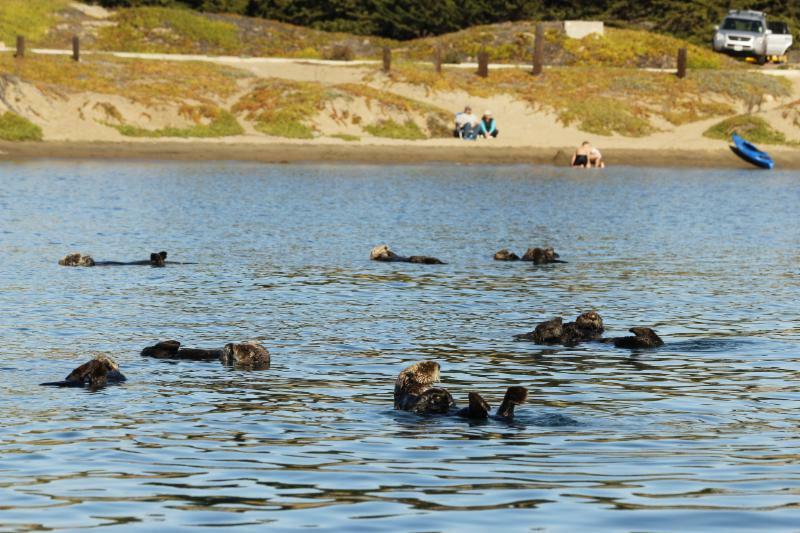 "Large gatherings of otters throughout the harbor have attracted tourists and locals all along the waterfront to experience them in their natural habitat," explains Jennifer Little, Executive Director of Discover Morro Bay. "You can watch along the shore or rent paddleboards and watch from a safe distance on the water as they forage for food and groom their young. They use rocks and other tools to break open crab and local food sources and are so fun to watch. We've seen up to 30 - 40 of them at a time floating around on their backs and enjoying life in Morro Bay." Just plop down a beach chair along the Morro Bay Harbor Walk and start watching - they're everywhere and easy to find. If there isn't a family of otters hanging out already, they will soon appear. The southeast side of Morro Rock is a great landmark for sea otter viewing as is Coleman beach at the intersection of Embarcadero and Coleman Drive. There are also public viewing spots all along the Embarcadero for wildlife viewing in between the plethora of restaurants, boutique shops and wine bars. To get an even closer look, paddle out in a kayak or rent a boat at Bay Cruisers and Electric Boats. Visitors can also take a ride on the Lost Isle Tiki boat to see the otters and the ever-barking sea lions, which includes a quick detour to the Morro Bay natural sand spit. Kayaks can be rented at Kayak Horizons and the Kayak Shack. Experts say what's really driving the population increase is the abundance of food they find in the waters of Morro Bay. 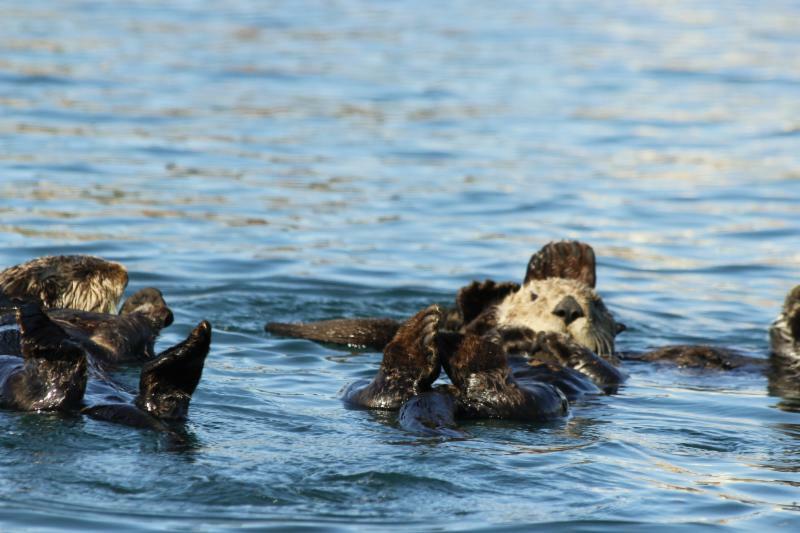 Sea otters are integral to the health of the Morro Bay harbor environment. When viewing otters be very careful as they are wild animals and may react poorly if approached. When viewing from the water, it's best to stay at least five kayak lengths away at all times and enjoy them in a responsible manner. Get out on the open road and visit Morro Bay, CA on Highway 1 in San Luis Obispo County, just minutes from Hearst Castle and teeming with California Sea Otters. A true gem, this seaside fishing village with bustling waterfront offers a picture perfect getaway for travelers who seek food, wine and outdoor adventures found in a gorgeous natural setting. Morro Bay's coastal climate is perfect for the abundance of year-round outdoor activities found in this unspoiled slice of California. Recently recognized in as her home in Finding Dory, Morro Bay was named as a Bicycle Friendly Community by the League of American Bicyclists, and outdoor activities are a way of life. From ocean-side golf, kayaking, sailing, hiking, fishing, surfing, biking, and bird watching, to kite flying, shopping, dining, wine bars, local craft brews and miles of unspoiled beaches, there is something for everyone. Located along coastal Highway 1 in midway between Los Angeles and San Francisco, Morro Bay is easily accessible from northern CA via Highway 101 South to Highway 46 West or Highway 41 West. Sitting majestically between the beach and the harbor lays the iconic and historic landmark Morro Rock, welcoming travelers from miles away as they approach Morro Bay. Located just minutes from world-renowned Hearst Castle, historic missions, breathtaking Montana de Oro State Park, and surrounded by vineyards from Paso Robles to Edna Valley, Morro Bay is a destination designed to fit any style and budget for families, couples or groups. Morro Bay also offers a myriad of year-round events including food, wine and music festivals, art fairs and car shows unique to the town. For more travel information visit www.morrobay.org or follow Morro Bay on its Facebook, twitter or Pinterest pages. (Washington, D.C., Dec. 21, 2016)American Bird Conservancy has petitioned the U.S. Fish & Wildlife Service to list the Oregon Vesper Sparrow as a threatened or endangered species under the Endangered Species Act (ESA). In a letter sent to Sally Jewell, Secretary of the Interior, ABC describes this subspecies of the Vesper Sparrow as highly imperiled and threatened with extinction throughout its range. The petition makes the case that the species warrants listing because of significant population declines and ongoing habitat loss and degradation, among other threats, and because it lacks adequate protection under existing regulatory mechanisms. Without ESA listing, the sparrows’ future looks grim. The current estimated population of the Oregon Vesper Sparrow is fewer than 3,000 birds, and Breeding Bird Survey data indicates a statistically significant population decline of more than five percent every year over the last 45 years. This migratory species has a restricted breeding range that historically included southwestern British Columbia, western Washington and Oregon, and northwestern California. Now, breeding populations have disappeared from British Columbia and California, along with numerous local breeding populations throughout the range. The species overwinters in California west of the Sierra Nevada Mountains and south of San Francisco Bay, and historically it ranged into northwestern Baja California, Mexico. But wintering populations in Baja and southern parts of California have now disappeared. The vulnerability of small, isolated breeding groups of birds. “Every year, more populations are being lost, and we are not seeing the establishment of new populations where habitat restoration has occurred,” Altman said. Existing regulatory mechanisms do not provide the protection needed to prevent the Oregon Vesper Sparrow from continuing on its trajectory toward extinction. There are no Federal or State programs dedicated to its conservation, and only about 20 percent of the birds’ range-wide population occurs on public lands. Without ESA listing, this vulnerable species will continue to decline and is likely to disappear forever. (Washington, D.C., July 25, 2016)A report released today by American Bird Conservancy contains some good news for U.S. mainland birds: 78 percent of the birds listed as threatened or endangered under the Endangered Species Act (ESA) have populations that are now stable, increasing, or have recovered enough to be delisted.The Endangered Species Act: A Record of Successanalyzes population trends and recovery success for all U.S. listed birds, including those in the Hawaiian Islands and U.S. territories. “Thanks to the Endangered Species Act, twice as many populations of listed birds are increasing as are decreasing,” said Steve Holmer, Senior Policy Advisor for American Bird Conservancy and the author of the report. "Meanwhile, species such as the Bald Eagle, Peregrine Falcon, and Brown Pelican have rebounded sufficiently to be taken off the list of endangered species." “This is a strong signal that the ESA works," Holmer said. But the report also shows the continuing problems for listed Hawaiian birds, many of whom face severe threats. Nine listed Hawaiian bird species are currently in decline. Overall, the ESA recovery success rate* for Hawaiian birds is 52 percent, only two-thirds of the recovery rate for mainland birds. The report also reveals that both mainland and Hawaiian bird populations can recover when adequate resources are made available. The recovery status of the Bald Eagle, Brown Pelican, Western Snowy Plover, San Clemente Bell’s Sparrow, Golden-cheeked Warbler, Black-capped Vireo, Interior Least Tern, Southwestern Willow Flycatcher, Steller’s Eider, Millerbird, Hawaiian Crow, Hawaii Creeper, and Nihoa Finch have all improved since 2006, whenABC produced a similar analysisof the ESA’s effectiveness. Even though the Endangered Species Act is working, it is under attack by some members of Congress. In recent years, individual species such as the Greater Sage-Grouse have been targeted for listing exemptions to prevent ESA protection. *The ESA recovery success rate is defined as the number of stable, increasing, and delisted species divided by the total of species extinct after listing, declining, stable, increasing, delisted, and unknown. The U.S. Army Corps of Engineers (Corps) and the U.S. Fish and Wildlife Service (Service) are taking additional steps under the Endangered Species Act (ESA) to restore balance to the Florida Everglades ecosystem and help reverse decades-long population declines of the endangered Cape Sable seaside sparrow. These steps are outlined in a new biological opinion on the Corps’ Everglades Restoration Transition Plan(ERTP), which was implemented in 2012 to guide improved management of water flows in the Everglades. The new biological opinion will guide the Corps and partners in the Everglades restoration effort in better managing water in ways that improve habitat essential to the Cape Sable seaside sparrow. Actions called for in the biological opinion include operational modifications and expediting restoration initiatives already planned for the southern portion of the Everglades ecosystem to aid in providing suitable nesting habitat for the sparrow. These measures will allow the movement of additional water southward under the Tamiami Trail One-Mile Bridge flowing through the Everglades and into Florida Bay in ways that avoid prolonged flooding of the sparrow’s habitat during the nesting season. They will also provide much-needed fresh water into the Everglades and Florida Bay, benefitting wildlife such as American crocodiles, West Indian manatees, sea turtles, dolphins, a variety of bird species and gamefish. The ESA consultation, biological opinion, and the resulting operational modifications are part of a broad collaboration between the Service, the Corps, the U.S. Geological Survey, the National Park Service, which manages Everglades National Park, and many others to save the ground-nesting Cape Sable seaside sparrow and meet water management needs. The actions reflect the complexity of restoration requirements across the Everglades and the commitment of local, state and federal partners to find creative ways to achieve long-term restoration and conservation. “Although the Cape Sable seaside sparrow is on the brink of extinction, we believe with the timely and coordinated action of partners, we can save this and other imperiled wildlife for the long term,” said Larry Williams, the Service’s State Supervisor for Ecological Services in Florida. The U.S. Army Corps of Engineers echoed the importance of state and federal partners collaborating in conserving the sparrow and the Everglades. Prior to Hurricane Andrew in 1992, there were 6,576 sparrows inhabiting Everglades National Park. Hurricane Andrew was followed by several wet years and high discharges of water through water control structures, causing several years of poor conditions for the Cape Sable seaside sparrow. This reduced the sparrow’s ability to recover from the impact of the hurricane and its total population declined to 3,312 in 1993. The Service began consulting with the Corps on the ERTP in 2015. Due to many factors, including loss of habitat, the sparrow’s population dropped to 2,720 in 2014. After one of the wettest nesting periods on record current preliminary results for 2016 indicate the population may have decreased to approximately 2,400 birds, the lowest on record. The biological opinion also addresses potential impacts to two other federally listed species—American wood storks and Everglade snail kites. Current water operations are not likely to impact these birds. Provide habitat conditions that will continue to facilitate sparrow breeding in areas where the existing habitat is of better quality. Provide habitat conditions that will allow the sparrow to successfully breed and recruit in currently degraded areas. Promote sparrow population resilience by identifying additional areas of habitat expansion or movement that may occur with implementation of water management projects and the onset of sea level rise. Monitor and demonstrate that successful sparrow breeding and recruitment is occurring in response to the implementation of management actions. The Service has developed a revised set of targets to improve the conditions of the Cape Sable seaside sparrow and contribute towards the survival and recovery of the species. Targets include providing at least 90 consecutive dry nesting-season days between March 1 and July 15. The marl prairie habitat that the Cape Sable seaside sparrow requires persists under a hydrologic regime of 90-210 wet days. If the habitat is dry fewer than 90 days, the grass habitat the sparrow requires often is taken over by woody plants. If the habitat is under water more than 210 days, a wetland habitat emerges. Conservation efforts on behalf of the Cape Sable seaside sparrow include annual range-wide population surveys by ground and helicopter, vegetation and hydrologic monitoring, use of prescribed fire to control woody vegetation, controlling wildfires to protect sparrow habitats, and banding birds so they can be identified in the future. The Service and partners are also developing new modeling tools and genetic studies and analyzing of sparrow blood and feathers to determine if there are contaminants, such as mercury that may be negatively affecting them. The mission of the U.S. Fish and Wildlife Service is working with others to conserve, protect, and enhance fish, wildlife, plants, and their habitats for the continuing benefit of the American people. For more information on our work and the people who make it happen, visit www.fws.gov.